We were warned that it would rain finally, and a good one, so I got over to my local plant-nursery and picked up three bags of pre-emergent and in the afternoon got it spread down on a large section of the field. Around 1:30AM I awoke to a drumming on the roof and the sound of wind outside, and it was pouring down. 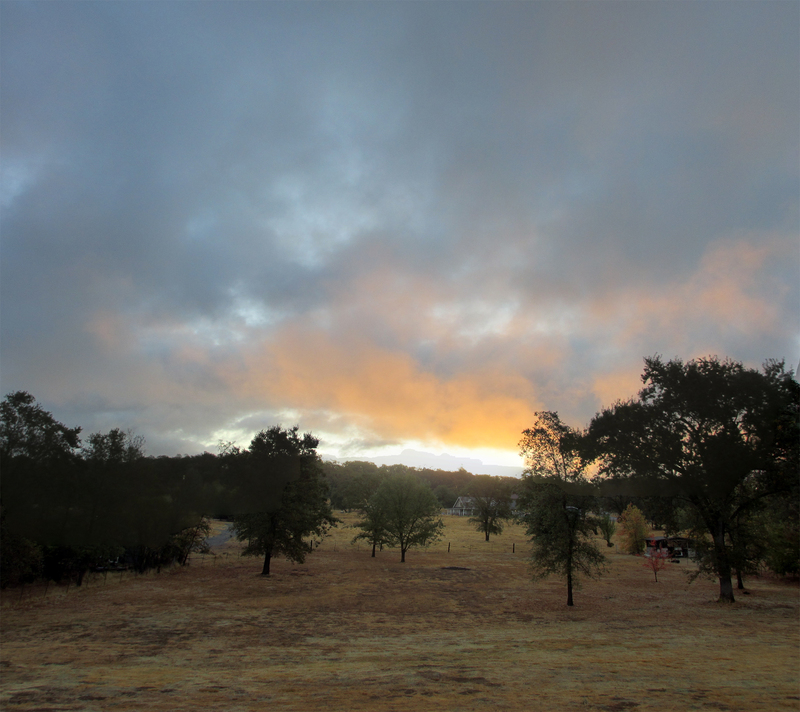 The morning dawned clear and cold with some clouds, and the pre-emergent had gotten rained-in, so we hope the savage weeds will be somewhat suppressed. Back at the ranch before all this started, I had just managed to get an appropriate shellplate into Big Red (shellplate #9) and practice some .44-40 de-capping and sizing, shoulder set-back and case-mouth belling (as it pushes up into the powder-drop). 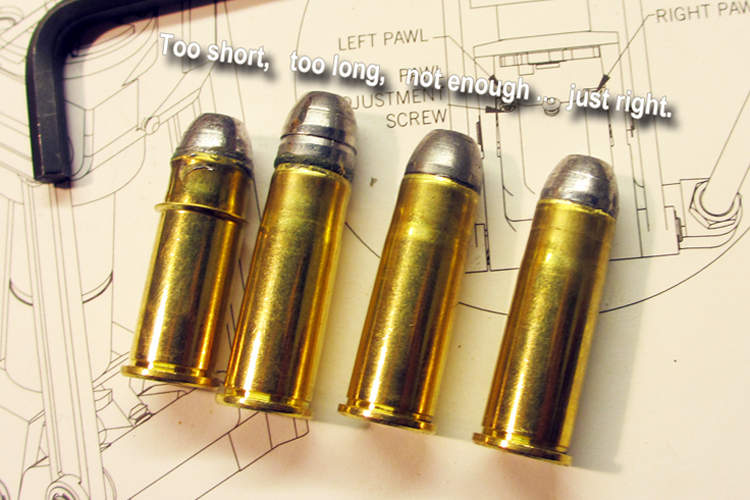 The 200-grain Oregon Trail “laser-cast” lead bullets squished a few case necks before I had the belling right, and I had to fiddle a bunch with the seating-die to get the correct bullet depth – and then had to back-up and get the crimp right….but I finally think I have it down. Just need to load and adjust the powder measure to drop some Trail Boss, and the primer-feed to seat primers. But tragedy struck and now I’m busy with other things, but this will provide a nice distraction once I start producing cartridges. Thank-you all for your consideration and kind words. The Enthusiast Press delivers advertising and product announcements to the target-audience, and is still a good source of reading material and sometimes fiction – and each media-outlet has an editorial voice that speaks to you differently. For me it’s an up and down vote, for an up and down voice. Let’s start with the two magazines that are currently in the magazine rack next to my comfy living-room reading-chair. Handloader is pretty straight-up and across-the-board: it’s necessary to be VERY factual since they are dealing with a topic that is potentially explosive. But there is also a good with a bunch of history and “how-we-got-there” type information – about powders and cartridges primarily, but weapons too. Without knowing where we came-from and being able to touch-base with that, it’s hard to keep (or stay) on course – as evidenced in several different cases of ballistic development. I really like what I constantly learn from Handloader, and that in fact there are historical and ground-level things that I DO learn. Back in subscription after a multi-year lapse is Shooting Illustrated, primarily because a well know and personal-favorite gun-blogger (two actually) has made the leap into semi-gainful employment therewith. The problem I have with SI now after reading its current issue, is a recollection of why it was among the first subscriptions I dropped. There’s a cozy, arm-around-the-shoulder familiarity in the writing, as everything gun-oriented and gunsteriffic is shootsplained to me. After finishing one article about rifle barrels and nitride finishes, I was thoroughly convinced there was NO OTHER WAY POSSIBLE – and wondered why all barrel makers didn’t follow the procedure. It’s like being in a room where the conversation flows like water at you, and they’re tellin’ you whatcha need to know – and it keeps repeating, and unlike The River in the Zen koan, this water and this Zen-versation can be re-entered into again and again – in fact it’s hard to get-out of it. Perhaps not my best use of metaphor, but the alarming and sustained repeatability…just started to wear thin. The ones missing from the rack because I don’t save or horde magazines are: NRA membership-publication American Rifleman. Like American Motorcyclist, the magazine of the AMA, it comes with the membership and covers NRA political issues, owner-interests, and scheduled events – like the matches at Camp Perry. Also missing from the current magazine rack (and in a HUGE departure from norm, saved for future reference) is the multi-layered and practical-tactical and intellectual SWAT (not what it seems at first). There’s a very good advocacy-driven section to SWAT, and a strong basis on actual-experiences that are brought to bear in the articles as-writrten. GUNS Magazine, and American Handgunner – both of which like others in the FMG media stable, tend to be more user-centric than G&A and VERY photo-centric, because there’s a lot to the visual aspect of guns that draws the eye. Meanwhile industry main-stay Guns & Ammo recently had a senior moment wherein one well-known, senior contributing editor and writer revealed his true feelings about the dirty plebeian, grunting, gun-owner troglodytes beneath him and the need to keep guns out of their hands. This gentleman with a University education and good grammar skills, seemingly misread and did not understand what the fundamental nature of a Right in this country actually is – and how it was threatened by constant attacks from the Left. Instead, from his intellectually superior vantage-point and apparent feelings of “empathy,” he fed the beast that attacks him – and was therefore ousted from his lofty position. Anyhow they’re pretty advertiser-driven and have never met a new product or major Manufacturer’s output they didn’t particularly like or pimp – including weird curved guns… Currently G&A is a read and toss that I no longer take very seriously. Monday was a BIG day, with the sofa-sleeper arriving in the AM that was too big to fit down the hall and had to go through the Office window on its back. Finally the room is mostly complete, with the vintage Macouillard Matson-Line menus on the wall and the Guatemala masks above the closet, there is now a guest-room that actual guests can stay-in. This could be about Cam Edwards and his radio-show but its not. It’s about the non-moving gizmo on the Whirligig-of-Doom that moves the wheel on primer-feeding “transfer-bar” contraption as it rises and falls, and on the up-stroke seats a fresh one in the brass case that was just de-primed on the earlier rotation’s down-stroke. And it’s supposed to have a specific bend in it, besides a small circlip that has a tendency to fly into orbit and hide in the carpet. Finally today the Cam Wire arrived, notched precisely for the ever-disappearing circlip, but straight as an arrow. I think I can get my High-Master shootin’ buddy Google-machinist to give me a hand and impart the proper angular coefficient to the dead-straight rod, but the label prominently marked with ATK on the package from RCBS reminded me of what Louis Awerbuck warned in Pistol I and II class, when he said much of the ammo (the ammo you CAN’T GET) that has been coming out from a certain cartridge-company umbrella-ownership group (= ATK) has been lacking a certain Q.C. je ne sais quoi – the stuff is bad. 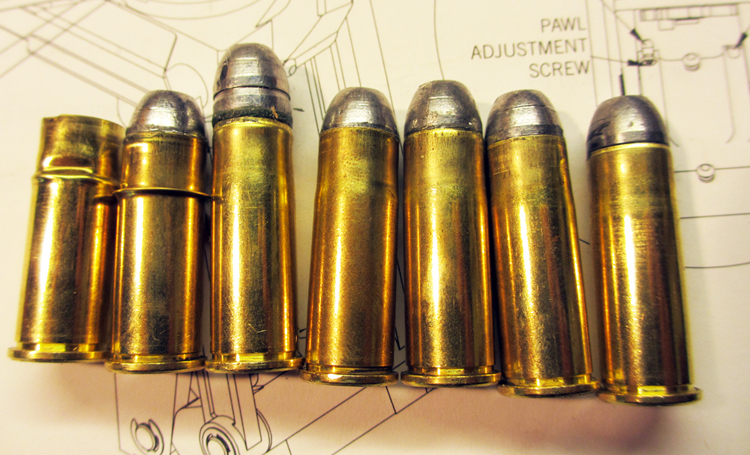 Bullets that are not at all crimped tie-up guns (this I have seen), OAL is sloppy, upsidown primers have been noted, backwards bullets too. Judging from my earlier telephonic conversations with the very friendly, super-knowledgeable and more polite than they need-to-be RCBS staff, I think the people trying to do business there are amazingly overworked and stressed. Perhaps it is the dumbrella Über-company corporate-ownership that is spinning lazily like the angry man in Zapruder’s film, or an ineffective overhead ceiling-fan on a hot day that is providing the source of conflict and anxiety. I hope things improve for them and that some time this year I get this thing ammo-construction device operational, before I have some kind of cardiac event. Need to get the “cam wire” figured out, but I managed to figure out how to set the shoulder back on a case using this infernal whirling contraption, and measure it with my headspace comparator gauge-thing! Sorta. That is I cheated and compared it to an actual round, and then made adjustments screwing the die-down until it matched, which is a way of overcoming my near complete math illiteracy. It’s bit of a kludge, like RCBS never threw anything away, they just rearranged the configurations. It’s one presssitting on top of another, the rams are joined by a link that fits like a male-female case-holder. Here’s the new superstructure mounted atop the old RS-3 press. It’s semi-manual, so you pop-in a case and then another and then another and it rotates and goes up and down and when one comes around finallly for a bullet you place the bullet on top and press it up, meanwhile another case is being de-primed and another is being primed, and one is loaded with powder, etc. The Upside is the shell-plates are the same as the Pro200 and now I have a bunch. And this is the bottom half. And it’s held together and operated by this ram connector. Fully functional and a good idea, engineeringwise…but it’s definitely not super-smooth in operation though that effect can’t be attributed to this link, it’s just an overall design issue. The term Steampunk fits I think? There should be a whistle attached somewhere and a bevel-drive gizmo-something running off the side, and sections wrapped in crocodile skin. 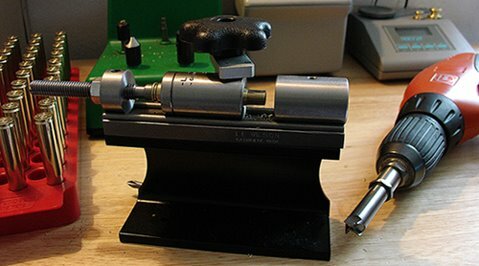 Just to illustrate an old post, here’s the Lee cutter mated to a case-length stop and affixed to position #1 on my RCBS Trim Mate. After de-priming and re-sizing in the press, the brass can be directly inserted over the gauge and trimmed to length. Voila. The RCBS “Trim Mate” case-prep thing puts five turning tools into one small place, but it doesn’t trim-to-length. I’ve removed the primer-hole uniformer-cutter (a Lyman hand tool that happens to thread right in) and laid it in the top tray. The #1 rotating station has a standard-thread long .22cal bore brush. 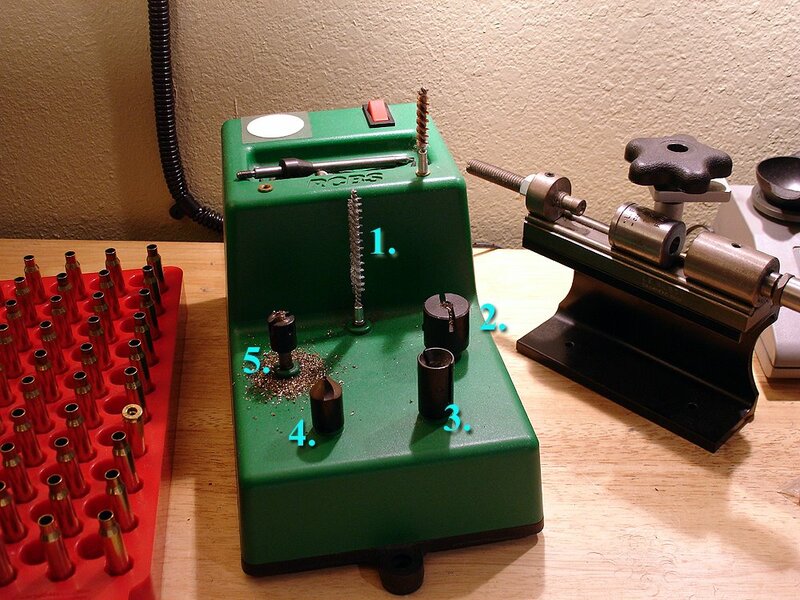 #2 has the military crimp remover/cutter, #3 has the outside chamfer, #4 has the inside chamfer tool, and #5 has the primer pocket reamer/uniformer. You can move them around to wherever you want for your own ergonomic convenience. For me the biggest time-spender has been trimming. One thing I really like about the RCBS tool though is that pressure is applied downward and (IMO) can be more evenly applied. With the Wilson trimmer I have to work it sideways, inserting the cutting head attached to a cordless drill and it feels awkward, not to mention the added set-up time with the Wilson; screwing it down to the bench and then setting the length – and as a “lateral” tool it takes up more space just to operate it sideways because you just need more elbow room. I don’t really need a 36-inch wide bench but trimming like this kinda demands it. Here’s a guy who figured-out another way to do it that I think I might test, and his bench isn’t even nearly as deep as mine! All I need is to do is fix up the Lee tool and cutter to do the length trimming. Awesome! In a previous post blogger Conservative Scalawag mentioned he’d like to start reloading but for the lack of room in his cramped apartment – with which I fully sympathize. 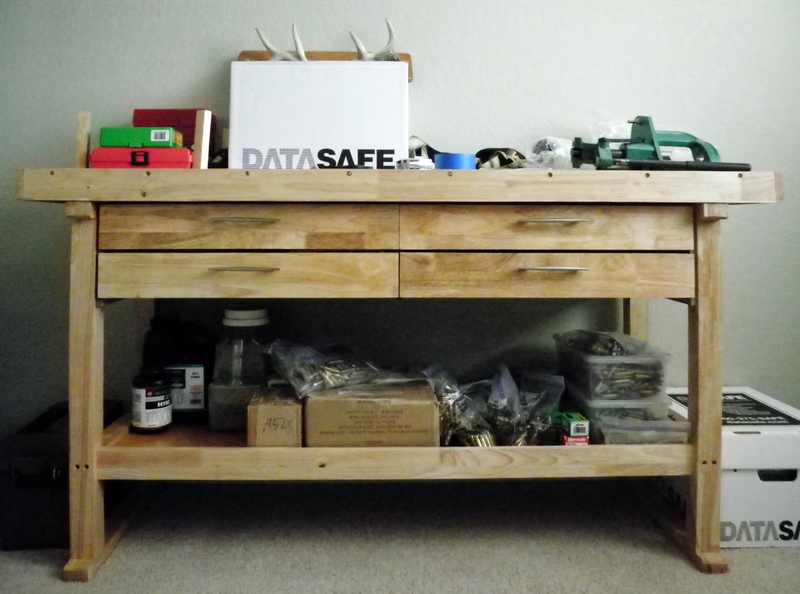 However, far from having a huge Gunnytastic Reloading Shackzilla, I have a 36″-by-17″ kitchen cart-thing from Target, and most of my junk is stored in a 2-drawer file cabinet in the closet – so fear not those of you with space constraints! 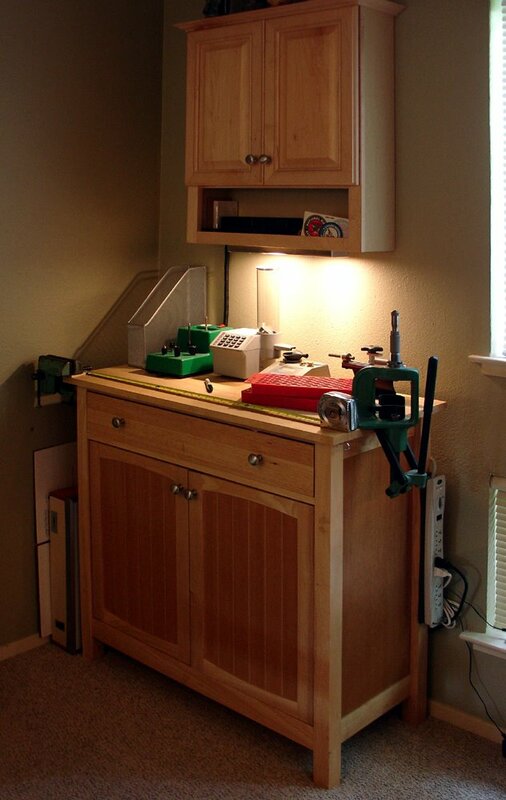 The bathroom vanity cabinet mounted on the wall holds measuring tools and small things, the wide drawer holds dies and things to bang on the press. And the double-doors hide empty brass, powders, bullets, and cleaning media. My small Dillon brass tumbler hides in the clothes-closet where behind a closed door its sound-signature is muted.